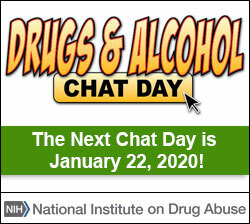 National Drug & Alcohol Facts Week / Get Activity Ideas / Blog it Out! Drugs & Health: NIDA’s Blog for Teens is full of emerging trends and the latest science-based research on drug abuse and addiction. Pick the posts you find most interesting and ask your teacher to use them in a lesson during class. You can ask questions or add your remarks in the comments section. You can even write your own blog post about how you plan to SHATTER THE MYTHS® and also share our blogs (or yours) on social media!